How long is this timber bolt? 10 inches? 30 inches? Try 155 inches; almost 13 feet long! 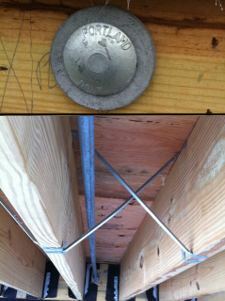 When building a custom beach house designed to withstand 130 MPH plus coastal winds, the builder determined that 83 inch and 155 inch long timber bolts were needed to perform as tension rods through the three different floors of the house. These custom bolts would provide additional strength to the structure that has many structural upgrades including hurricane resistant doors and windows, extra thick walls and roof, and high grade marine pilings. Portland Bolt can make headed bolts that are 13 feet long or even 40 feet long, the only limit is the length of the raw material. The bolts were hot-forged with “Portland Bolt” clearly visible on the head of the bolt. This marking was created with custom forging tooling that produces a head marking which serves as permanent marketing and identification on the head of the fastener. This tooling is interchangeable and for a cost, Portland Bolt can produce tooling with your company name or logo and manufacture headed bolts that identify and distinguish your work on a project for decades.